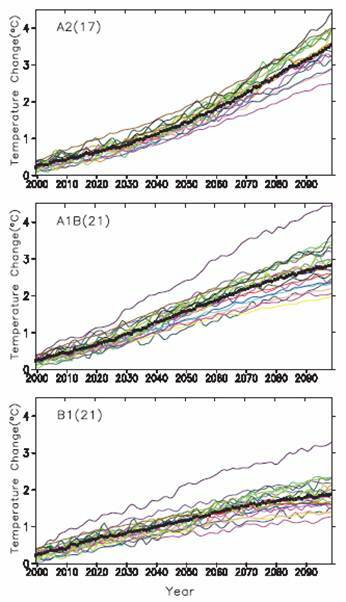 The IPCC provides temperature “projections” as part of their assessment reports. They say they are not “predictions” since they are based on various scenarios involving different amounts of CO2 and other gases in the future. The CO2 based models appear to be overestimating the amount of warming. 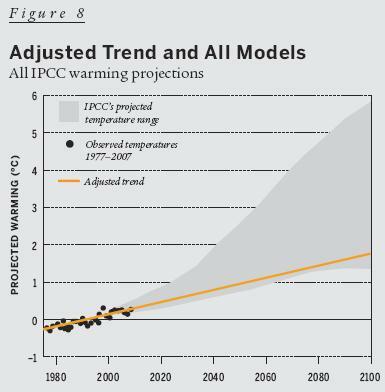 The IPCC provides temperature “projections” as part of their assessment reports. These projections are based on various “storyline” scenarios using various amounts of CO2 to drive the global circulation models. In a revision of the AR4 Summary for Policymakers (2008) the following figure became the Figure SPM.5. 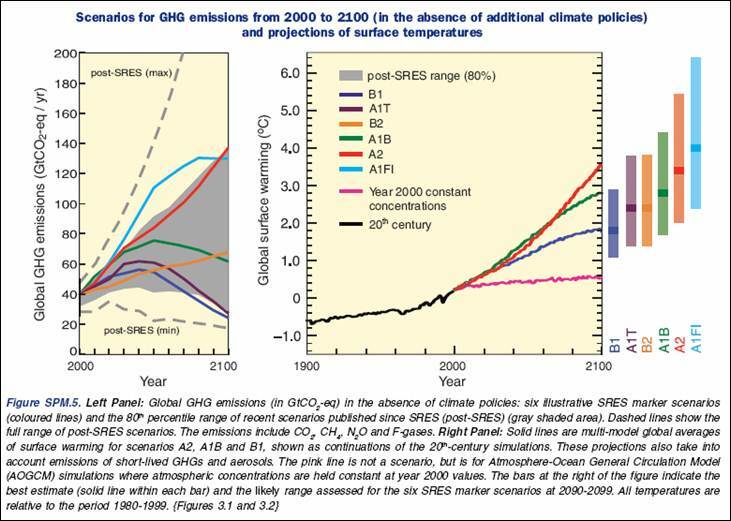 The left-hand side of the figure shows the scenarios in terms of the GHG emissions. The warming and seal level rise estimates for the scenarios are summarized in the following table. The following figure compares the TAR (left) and AR4 (right) projections from the above figures. The main difference is that they don’t display the blue “envelope of the full set of thirty-five SRES scenarios” in the AR4 and the A1F1 scenario is no longer displayed as a plot on the graph. The following table compares the TAR with the AR4 in terms of temperature plots for various models for a couple of the scenarios. the spread of climate sensitivity estimates among current models arises primarily from inter-model differences in cloud feedbacks … Therefore, cloud feedbacks remain the largest source of uncertainty in climate sensitivity estimates. http://www.climate-skeptic.com/2008/06/gret-moments-in.html). The Figure 3 caption also provides a brief explanation of the scenarios. 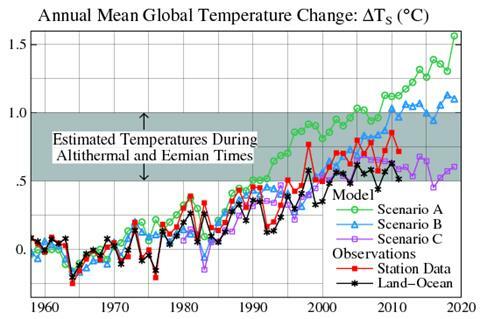 The following figure compares the observed global temperature with James Hansen’s climate model predictions used to start the global warming scare in 1988. The observations still most closely match scenario C (which had reduced CO2 emissions rate from 1988 levels into the future “such that the greenhouse gas climate forcing ceases to increase after 2000” – see http://www.appinsys.com/GlobalWarming/HansenModel.htm for more info on Hansen’s models). 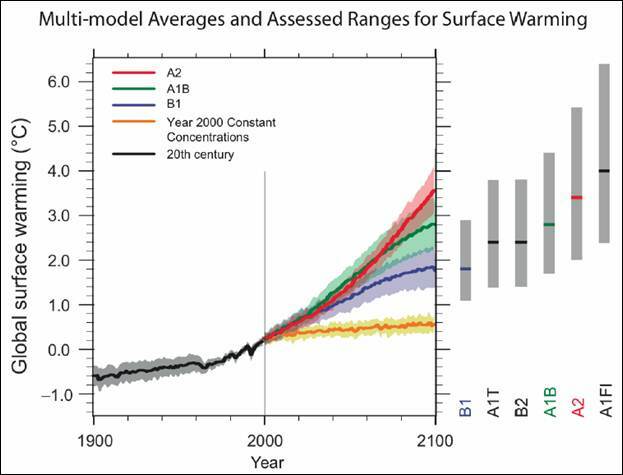 Scenario A is the only scenario with an increasing rate of CO2 in the graph below. 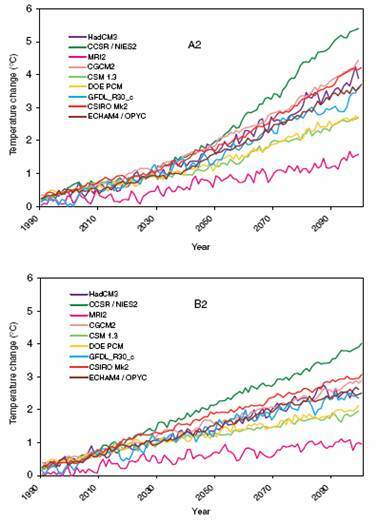 The next figure shows the greenhouse gas emissions scenarios used in the plots, as well the observed (1988 – 2008) plus future based on scenario B. The observed CO2 emissions is closest to the scenario B input, but the observed temperature is closer to scenario C output – indicating a problem with the models. 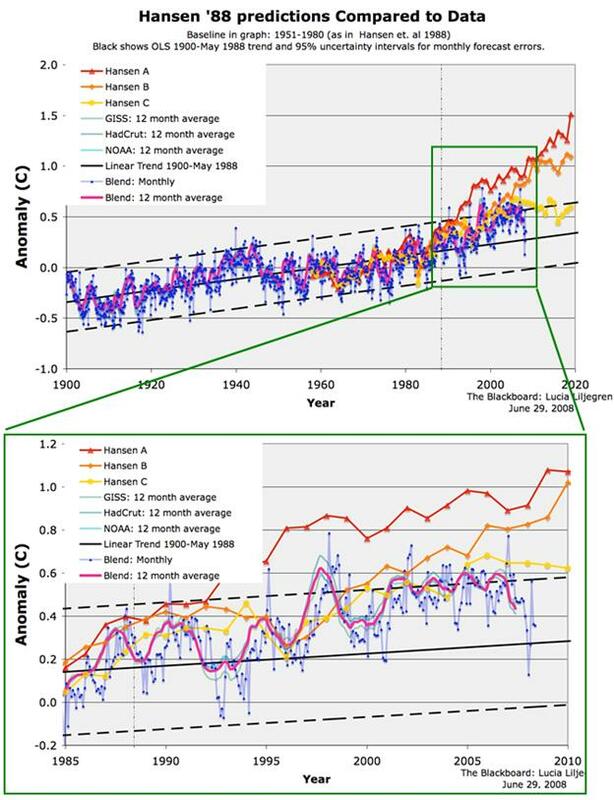 (Figures from Steve McIntyre [http://www.climateaudit.org/?p=3354] ). 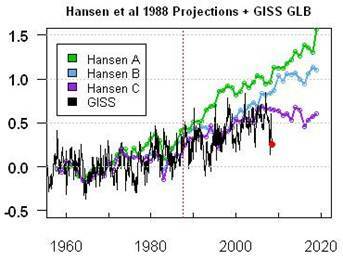 The next figure shows a plot of Hansen’s predictions along with actual temperature data from various sources – GISS, HadCRU and NOAA (from: http://rankexploits.com/musings/2008/ordinary-eyeball-how-did-hansens-predictions-do/ ). The following figure compares Hansen’s 1988 projections (green) to the 2007 IPCC. Twenty years has produced a reduction in the projections from Hansen’s to the IPPC’s. 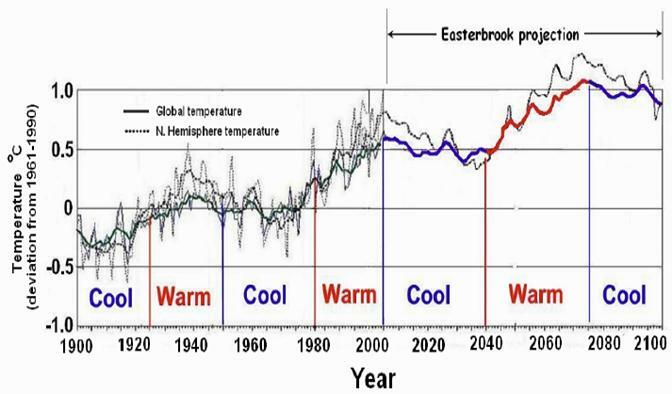 Don Easterbrook (geologist at Western Washington University) made predictions in 2001 as to the future global (and northern hemisphere) temperatures to the year 2100. 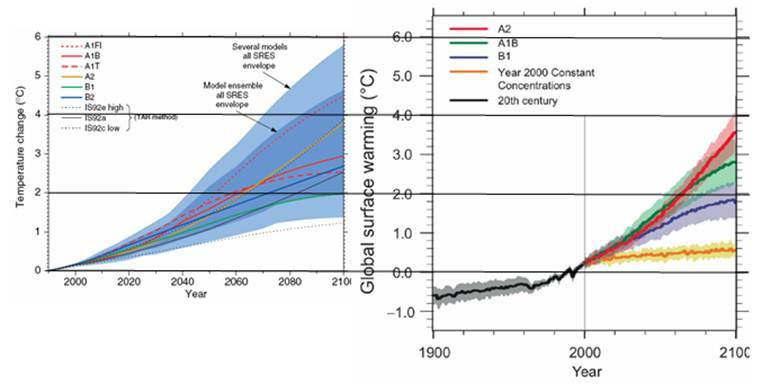 The following figure compares Easterbrook’s projections with the IPCC AR4. 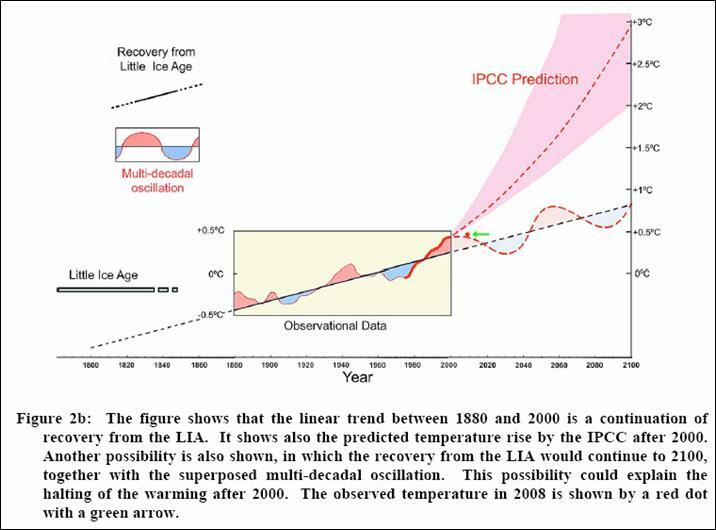 The following temperature projection contradicts IPCC’s assessment of future scenarios (from http://people.iarc.uaf.edu/~sakasofu/pdf/two_natural_components_recent_climate_change.pdf). Patrick Michaels (former Virginia State Climatologist, UN IPCC reviewer, Professor of Environmental Sciences at University of Virginia) made projections in 2008 as to the future global temperatures to the year 2100 (http://www.cato.org/pubs/regulation/regv31n3/v31n3-2.pdf). This linked paper also provides a good overview of urban warming and other biases that influence surface station measurements. 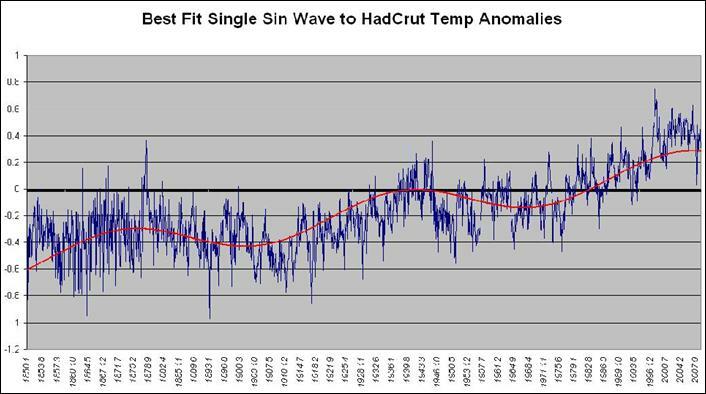 Joe the actuary [http://digitaldiatribes.wordpress.com/2009/02/10/deconstructing-the-hadcrut-data/] made some calculations fitting a single sine wave to the HadCRUT temperature anomaly data. The following two figures show (top) the curve fit to the data, and (bottom) the curve extrapolated to 2050. The 2050 projection is lower than the other estimates. Only time will tell. Based on the HadCRUT global temperature anomaly data, I made the following prediction for the global average temperature over the next 100 years. 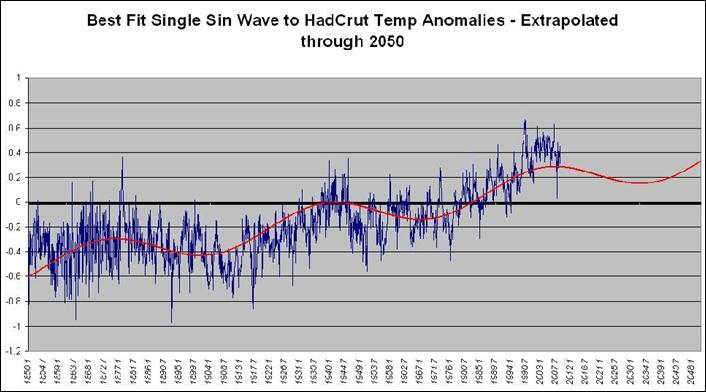 From the early 2000s anomaly of 0.4, I predict there will be an additional 0.2 degree increase by 2100. See: www.appinsys.com/GlobalWarming/PredictionFromCycles.htm for more details on this prediction method. Of course this method is simply based on recurrent 60-year cycles. The underlying increase may be due to CO2 – or there is just as likely a longer cycle which will result in a larger cooling trend at some point. 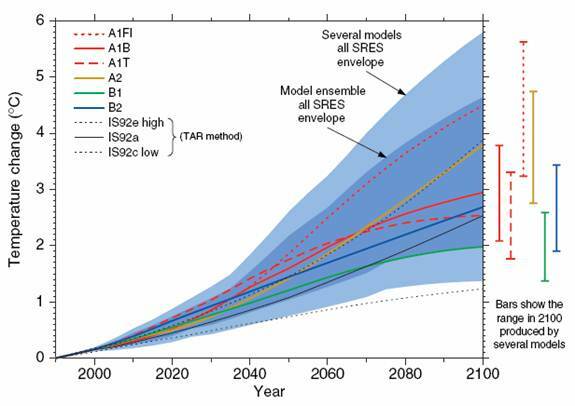 The following figure compares my prediction (in purple) with the IPCC AR4 projections under various scenarios. My prediction matches fairly closely to the “year 2000 constant concentrations” scenario. The warming in my projection could actually be a result of CO2 – but without the positive feedback due to water vapor assumed by the IPCC climate models. Roger, who runs Tallbloke’s Talkshop (http://tallbloke.wordpress.com/) developed a global temperature prediction model. (See: http://tallbloke.wordpress.com/2012/10/23/the-carbon-flame-war-final-comment/) He says “I have put together a simple model which replicates sea surface temperature (which drives global lower troposphere temperature and surface temperatures a few months later). 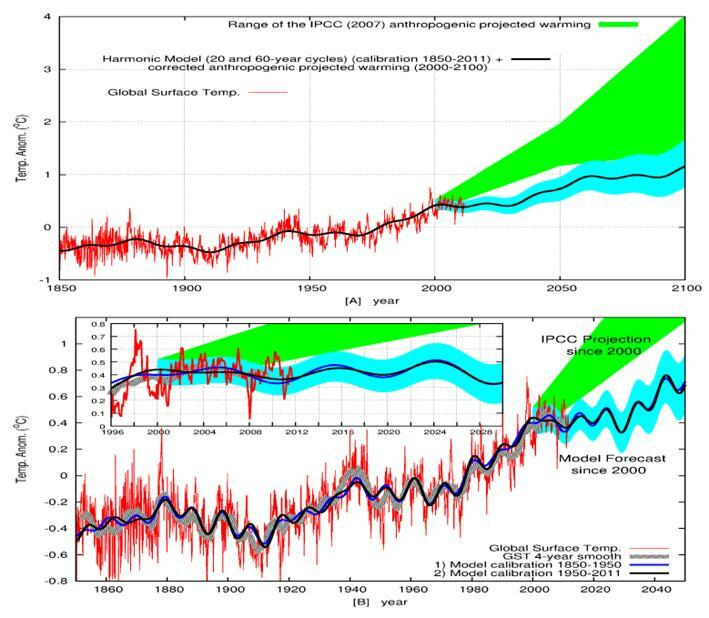 The correlation between my model and the SST is R^2=0.874 from 1876 FOR MONTHLY DATA.” The model is shown below with predictions to 2050 (blue) along with the HADsst3 (red). The following figure compares my projection (from the previous section of this document) with the Tallbloke Projection overlaid on it. Mine has more cooling in the later 20-teens with close agreement in the 2040’s.